The delicate notes of Aspinal's Scented Candles will fill your home with a carefully blended fusion of welcoming refreshing scents. Invigorate your senses with a selection of uplifting fragrances, from the zesty bouquet of Grapefruit to the woody overtones of Fig and Olive. Discover the fresh, floral aroma of rose, gardenia and jasmine or explore a myriad of exotic scents to match your mood with our intoxicating Candle Trio. A treat for your home and a beautiful gift for a loved one. 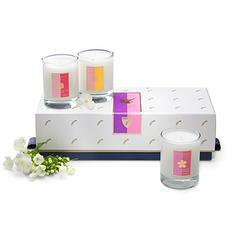 Awaken your senses with our intoxicating and refreshing range of scented candles. Whether you need to lift your mood, stimulate your awareness or delicately fragrance your home, we have a scent to capture them all. So satisfy your senses and drift away in the ambiance of an Aspinal Scented Candle!